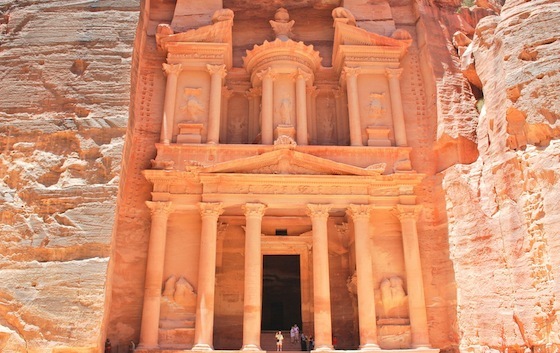 Petra’s pink city was built by water smart Nabateans. Ancient Jewish prayers still recited today include special mention of dew in the summer and rain in the winter. Survival of Israelites back then, and of the Israelis in modern times, rests largely on how much water is available for agriculture. While Israel has answers to drought such as desalinating water, researchers in Israel’s Negev Desert look for more sustainable solutions that have been in use on the land since time immemorial. Based on techniques used by the ancient Nabateans, Prof. Pedro Berliner, director of Israel’s Jacob Blaustein Institute for Desert Research at Ben-Gurion University in the Negev, is reviving effective and natural desert farming methods from 2,000 years ago. The Nabateans settled the lands of present-day Israel, Jordan (where they built the glorious pink city of Petra), Saudi Arabia and Syria. Berliner believes that their system for making the most of rare desert rain, when put into a modern framework, could save people in developing countries from desertification, drought and famine. His updated technique is already in use worldwide. Prof. Pedro Berliner at Wadi Mashash, one of the areas in the Negev Desert using the updated ancient system for conserving floodwater. The Nabatean approach altered the ecosystem of the land by collecting and channeling floodwaters through desert canals to provide food, firewood and fodder for animals. Berliner’s contemporary version, the runoff agroforestry system, involves planting rows of trees with crops in between the rows that help prevent floodwater from evaporating. Adding legume plants provides composted leaves that are an excellent fertilizer for the crops in between the trees. People under threat of desertification can use this sustainable method to ensure they can produce grain, fodder from the leaves of the trees for grazing animals, and firewood using the branches. An entire community can be built around winter rain runoff, as Berliner explains when he travels around the world showing researchers and farmers in countries such as Kenya, Turkmenistan, Uzbekistan, India and Mexico how they can fight against desertification looking to Mother Nature, the way the Nabateans did. In Israel, the runoff agroforestry system is currently being used by Bedouins to farm olive groves and in Wadi Mashash, the desert research farm maintained by Ben Gurion University, where Berliner does his field work. Desertification – the encroachment of non-arable land into areas once suitable for farming and grazing — is expected to get worse as the effects of global warming intensify. As the planet’s population increases, so does the need for wood for fuel and land for grazing, two more factors that greatly increase desertification. Winter flood runoff techniques helped the Nabateans survive and protect their trade routes — they specialized in transporting perfumes and spices from Saudi Arabia via camel caravans through to the Gaza port — until they were conquered by the more powerful Romans. But their legacy in water on the land of Israel lives on.